April 23, 2019 Robert W.
Fast turnaround vinyl banners are needed for those unexpected events or in some cases, where you simply forgot to order your banners before the event. However, there are sign stores in Las Vegas that can make those fast turnaround vinyl banners the same day or the next day. Modern sign stores have the latest in printing technology with state of the art large format printers that can print very quickly. These large format printers are capable of printing several hundred square feet of banner an hour in many cases. The quality is much improved with these newer models using eco solvent ink with eight colors instead of the traditional cmyk. The additional inks add color richness and brightness that the four color printers cannot hit. Many people that attend the trade shows and conventions in Las Vegas require banners and signs because there signs get damaged or do not show up in time for the event. Since Las Vegas is the most popular place to hold events and shows, thousands of vendors come to Las Vegas annually to participate in these vents, which attract millions of attendees to the shows. These vendors need quality banners and signs quickly and Las Vegas has many sign stores that offer same day signs and printing to accommodate their needs at an affordable price. These sign stores are generally located near the convention and trade show venues for easy access and quick sign turnaround. These banners are full color, meaning that they can print with any color or combination of colors and you can also print logos and pictures on them. The speed at which the print has actually lowered the cost of the banners over the years. Contact your local sign store to have them make your fast turnaround banners and other signs quickly and cheaply. 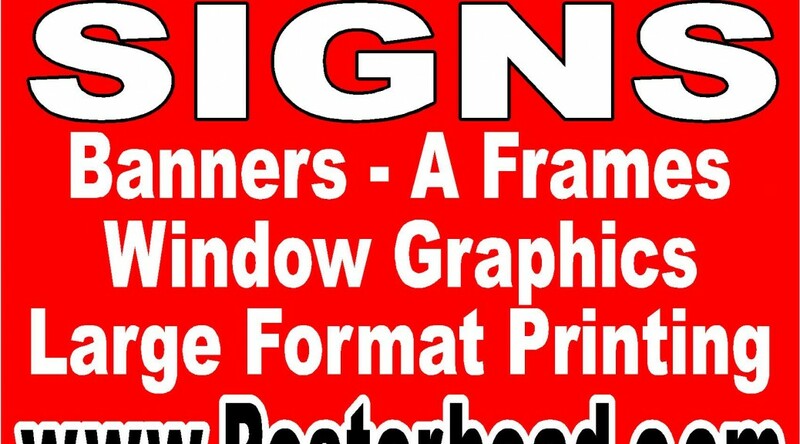 February 15, 2019 Robert W.
Las Vegas banner printing sign store can print and design those vinyl banners needed for events and business. Vinyl banners are a great way to market to customers at a very inexpensive price. 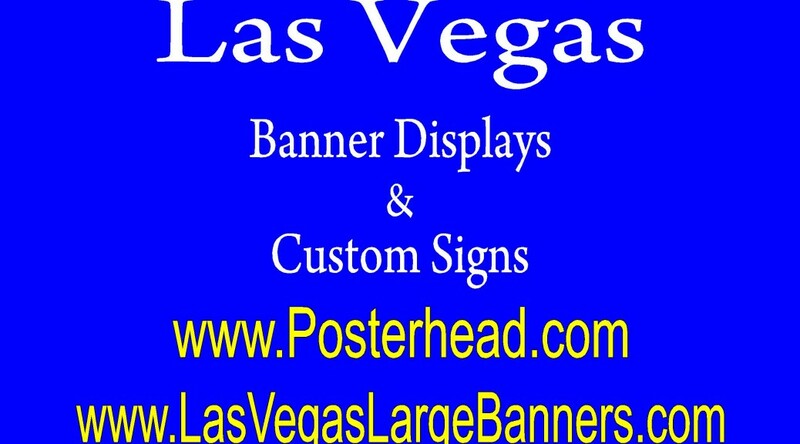 Las Vegas banner printing sign store can print directly on banners with their large format printers at a great price. The price of printing vinyl banners has actually fallen in the last few years because of the speed of the printers allow for more production. Improvements in ink has also lowered the price of printing as well. Las Vegas banner printing sign store uses large format printers that can print at very quick speeds, many at more than two hundred square feet of banner print an hour. This is a major upgrade from printers just a few years older. The large format printers use special eco solvent inks or latex inks that are environmentally friendly that can withstand the hot summer sun the Las Vegas experiences every year. The banners are printed on a 13 ounce vinyl banner material and then hemmed on the outside of the banner to strengthen the perimeter and then grommets are placed every couple of feet at the top and bottom so that the vinyl banner can be hung easily. Banners can be made in many different sizes from 1 foot by 4 feet all the way up to 8 feet tall by 50 feet wide and bigger ! Because of the speed at which the vinyl banners can be printed, many times the banners can be made the same day, which is a plus to vendors who are displaying at the convention venues who often need banners and signs at the last minute. Las Vegas banner printing sign store can get you those vinyl banners printed at a great price and reasonable fast. Contact a sign store today about getting banners printed for you. January 23, 2019 Robert W.
Las Vegas sign store making signs and banners is what you need when you are looking for banners and signs for your store or event. Every business or store needs assign to identify themselves among the competition and help people guide them to their location. Without signs, we would not know where to go. Las Vegas sign store making signs and banners can get you those signs in many different types. Las Vegas sign store making signs and banners can make may different types of signs for your business. Vinyl banners are one of the cheapest forms of signs you can make. Many businesses have had great luck with a simple advertising banner hung on their building to grab the attention of the many automobiles that pass the store everyday. These vinyl banners can be hung at the top of the buildings or on fences to garner the attention of passing cars. In fact, stores that are adjacent to the freeways usually will place a very large banner on the back of the building that faces the freeway to get the attention of the thousands of vehicles that drive the freeway every single day with great success ! These large banners act as a billboard almost but without the monthly expense of rent. This cost of advertising is just a few cents a day and gets seen by thousands of people weekly for store identification. Las Vegas sign store making signs and banners can also get your front door and windows lettered so people can easily identify your company. These simple vinyl letters are found on most front doors or adjacent glass and contain the company’s name, hours of operation, telephone number. Signs can make or break your business because every business or store needs to get noticed. Contact your local sign store to see how they can help you. January 20, 2019 Robert W.
Vinyl banner printer in Vegas can get you those vinyl banners needed for your event or business. Vinyl banner printer prints those advertising banners or display banners to get you noticed among your peers. Las Vegas area businesses use them as a means of marketing to the public in a cost effective way. Vendors at the events and shows use them as a way of grabbing people’s attention at the event. Las Vegas area stores are learning that vinyl banners is a cheap way to advertise to customers. With the increased population in Las Vegas and neighborhoods constantly changing with people moving in and out, neighborhood stores are using cheap vinyl banners as a way to market to the neighborhood. By placing a product or service on a banner and placing that banner on their building or on a fence where it can be seen by the thousands of cars that pass by every week, they get their advertising message across in a cost effective way. Stores that are adjacent to the freeway are using very large banners on the back of their buildings to advertise to the thousands of vehicles that travel the freeways everyday. These large vinyl banners, 8ft x 20 or 30 feet long act as a billboard , but without the monthly rental expense. In fact, they are so effective, this past election season in Clark County, many politicians did this exact method to get their name in front of the public with great success ! Vinyl banner printer in Vegas is also good for those many banners that are needed for the conventions and trade shows in Las Vegas. There are hundreds of these shows a year in Las Vegas and all of them need signage for their display booths. Vinyl banners are a way to get your business noticed. January 9, 2019 Robert W.
Wholesale vinyl banner printing is available in Las Vegas at certain sign stores that have their own printing equipment. I make the distinction because many sign stores in Southern Nevada have very little equipment to print and make signs and have to rely upon other sign companies to print vinyl banners and signs for them. Wholesale vinyl banner printing is specifically done with large format printers. The most modern banner printers can print in speeds of excess of two hundred square feet per hour with fantastic quality. The newer printers utilize the eight color ink system instead of the traditional cmyk inks and therefore can print better gradients and can print more rich and darker colors than ever before. Some of these printers utilize the two print heads that allow much faster printing than the traditional one print head system. Allowing more square feet of print increases the profitability of a machine and that cost savings is passed on to the consumer. Wholesale vinyl banner printing is limited to people in the trade and you should contact your local sign stores to see what they will do for you. The current going price for vinyl banners is $2.00 a square foot and this is printed on a 13 ounce vinyl banner material using eco solvent inks ( inks that are ecologically and environmentally safe). The banners after printing are then hemmed ( the edges taped and double folded to add strength to the perimeter ) and then grommets are placed all around the vinyl banner approximately every two feet so as to make it easy to hang or install the banner with the premade and reinforced grommet holes. The banners can be text only or full color ( meaning you can have as many colors printed on the banners as you want) and also pictures and logos can be printed on the vinyl banners. January 6, 2019 Robert W.
Cheapest full color banner and sign printing in Vegas will lead you to that sign store that can print your sign and banner inexpensively. After all, why pay retail for signs when you do not have to. There are many sign stores in Las Vegas that can offer you cheap, low cost printing of signs. These sign stores can offer you cheapest full color banner and sign printing because they have the latest full color printers that can print at faster speeds than ever before and with greater quality than there predecessors. These new, state of the art large format printers print with speeds in excess of two hundred square feet of banner an hour. This allows a sign store to print more banners during the eight hours they are open and pass those saving on to the customer. Cheapest full color banner and sign printing are using eco solvent inks that are ecologically sound that can print more vibrant colors than ever before. Many of these printers use the eight color ink systems rather than the traditional 4 color cmyk inks and are able to printer a wider variety of gradients as a result. Cheapest full color banner and sign printing allows for printing of vinyl banners, banner stands, sidewalk signs, window graphics, car wraps and many other types of signage. Full color banner printing can be printed for around two dollars a square foot ( which includes hemming the perimeter for extra strength and grommets) and around $3.00 a square foot for vinyl printing in full color. These are great priced for trade shows and conventions where signs and banners will be only used for a few days before they are thrown away. Seldom do trade show signs get reused because the different shows require different sets up graphics and with everything constantly in a flux in business, new products and services are always being introduced. January 5, 2019 Robert W.
Trade show vinyl banner printing in Vegas can get you those custom vinyl banners needed for your convention or trade show. Trade show vinyl banner printing is big business during the trade show season in Vegas that runs January through May. Millions of visitors descend down on Vegas during these crucial months where thousands of companies and vendors set up displays to make clients aware of the new products and services available. The Biggest of the biggest comes in January, when the Consumer Electronic Show comes to Vegas bringing hundreds of thousands or participants from around the globe. Just after that, the world famous World of Concrete comes roaring into town bringing hundreds of thousands of more participants to the Las Vegas Convention Center. Sign and banners are very much needed for these two events and many, many more events that come to Las Vegas. Trade show vinyl banner printing is an integral part of those signs that are needed. Many hundreds of backdrop banners, table banners, side banners, banner stands and others are needed to be printed for these events. Trade show vinyl banner printing is not expensive in Las Vegas. Vegas has some of the most modern and affordable sign shops in the country. Trade show vinyl banner printing has never been less expensive than ever before with the use of state of the art printers that can print banner and signs at very fast speeds with excellent quality. These modern day printers can print in excess of two hundred square feet per hour and run 24/7. Banner printing has never been more affordable than it currently is. The going rate for trade show vinyl banner printing is about two dollars a square foot with discounts for heavy volume. Contact a sign shop today if you need vinyl banner printing for the different event venues. January 3, 2019 Robert W.
Cheapest vinyl banners in Las Vegas can get your advertising banners printed inexpensively and fast. Many stores are catching on the vinyl banners is a cheap alternative to expensive advertising and have start using vinyl banners at their locations as a way to market to their customers. 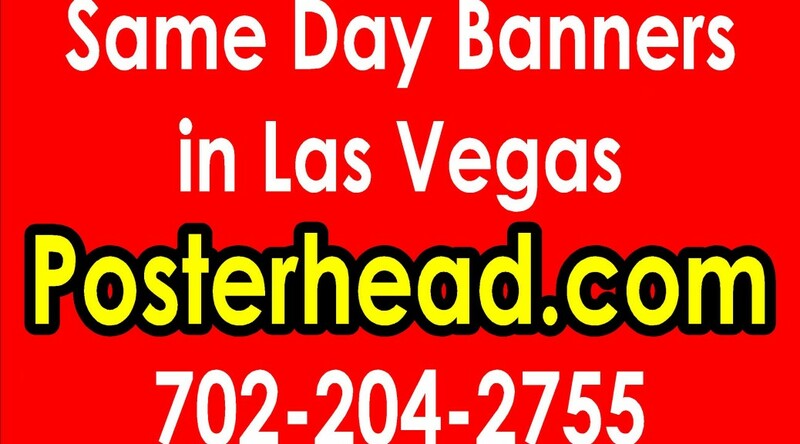 Cheapest vinyl banners are used by a variety of businesses in Las Vegas. There is a used car dealer that makes a banner every week to advertise a car for sale. he prints a picture of the car on the banner, the price and other pertinent information about the car on the banner and places it on a fence that is clos to the street. Every day thousands of cars go by and view the car for sale banner. The car always sales and he makes another banner for the next car he wants sold. Another business offers pizza specials on his banners. Every week they advertise a banner with a food special to draw in customers. The pizza place has eight of these advertising banners that he rotates weekly to drive sales with a tremendous amount of success. Cheapest advertising banners cost around two dollars a square foot. This can be a text banner or a full color banner with pictures on it. The vinyl banner is printed with outdoor ink to prevent fading in the hot summer sun. The banner is then hemmed ( folding of the edges to double the strength at the perimeter for the grommets) and then grommets are placed about every two feet on all four corners so to make it easy for the banner to install. Cheapest vinyl banners can be purchased at local sign stores in the area. Contact a sign store today to see how these low cost vinyl banners can help out your business. January 2, 2019 Robert W.
Indoor stand up banners for events are a great choice for graphic display. These compact stand up banners are easy to set up and can be displayed practically anywhere because they are stand alone, meaning you can place these stand up banner stands for display without requiring them to be secured to anything. Indoor stand up banners are widely used at trade shows and conventions in Las Vegas. Local businesses are using them as a way to advertise products in their stores. This is especially true in the clothing stores where indoor stand up banners are replacing mannequins as a way to show models wearing the clothes. The indoor stand up banners can have all sorts of backgrounds to impress customers and can have various models wearing different types of clothes the store is selling. These banner stands take up very little space compared to a mannequin. 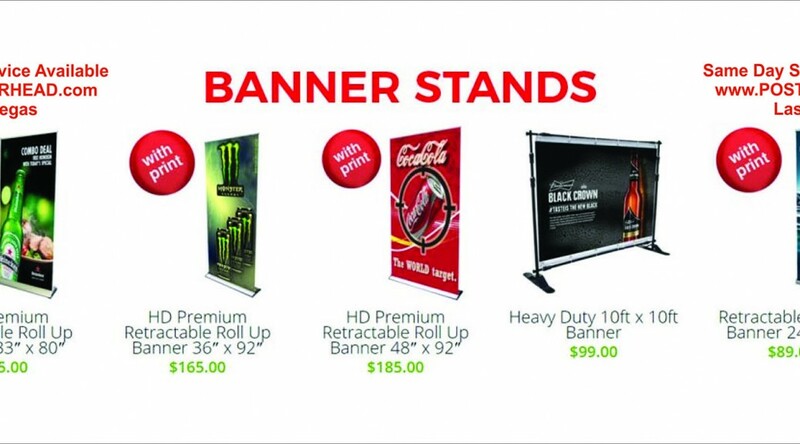 Indoor banner stands come in many sizes to accommodate your display needs. They come in as little as 2 feet wide to around 5 feet wide and in the economy and deluxe versions. The most popular stand up banner costs less than one hundred dollars and many of the other models are priced at under one hundred dollars. Printing indoor stand up banners has never been made easier due to large format printers using 8 color ink systems that can mix inks to make brighter and more vivid colors. These indoor banner stands can have pictures printed on them with amazing clarity. Indoor stand up banners can be designed and printed at local sign stores in the Las Vegas area very quickly and inexpensively. Contact a sign store today if you should find yourself in need of a banner stand. They only take a day or two to make and often can be made the same day.